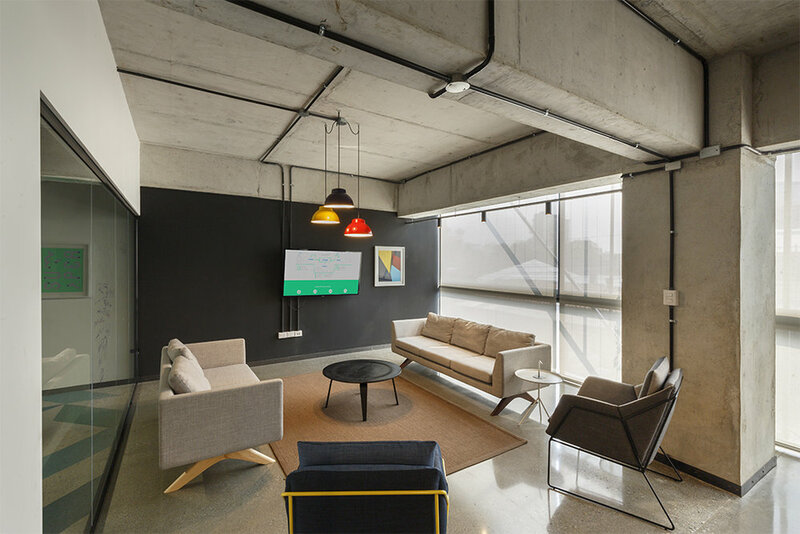 Osigu was designed like a loft style office resulted in a dynamic space which includes diverse collaboration spaces, a full garden to chill out and comfortable breakout areas. the office occupies 890 sqm of these only 710 sqm are from contruction and additional 176 sqm of green areas that conform the four levels up of 4 Venezia. The main reason is that OSIGU as a client and in collaboration of O&B has called upon many talented current designers and creative to bring in a bit of life and energy to its workplaces. Cool workplaces uses chalkboards and doodles on walls to express each other, as inspiring wall murals. These brilliants custom made murals was created by Jose Miguel Muñoz Escobar y Andres Asturias. A collective of some of Guatemala´s most talented and experienced contemporary artists, and illustrators, who produced this funky masterpiece. Contemporary carpets designed with architecture in mind! using multi coloured carpets to make a brilliant and shine office.